Hexagon dome nuts also called Acorn nuts because the head shape is similar to an acorn. They also go under the name Crown nut, Blind nut and Dome cap nut. 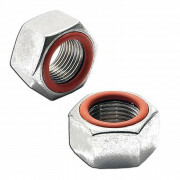 The nut is forged in one piece with a cap at one end and is normally available in steel, stainless steel, Nylon and brass.